Motorists were yesterday warned to take care on roads because gritting treatments were expected to be “less effective” due to plunging temperatures overnight. 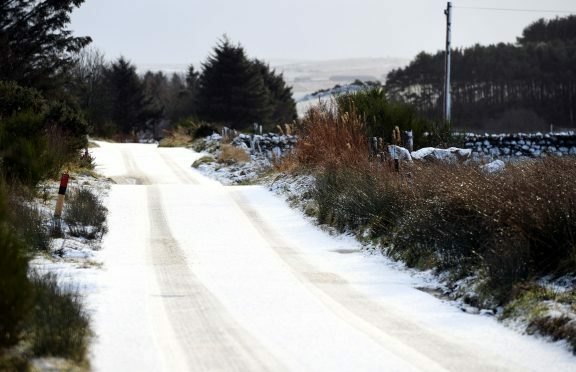 Forecasters predicted it would be the coldest night of the year so far with Arctic air hovering above the country pushing temperatures below -13C in some remote Highland areas. Last night the Aberdeenshire Council roads department informed drivers of an expected “cold spell” across the region. Yellow Met Office warnings issued for ice in the Grampian and Highland regions will remain in place until 9am today with a 10-15cm snow fall expected on higher ground. Rock salt lowers the freezing point of moisture on the road surface preventing ice from forming but only works properly at temperatures above -5C. Moray Council also confirmed plans to grit all its main routes overnight, including roads in Elgin, Buckie, Forres, Lossiemouth and Dufftown. The gritters will also be out this morning. Met Office spokeswoman Nicola Maxey warned the country could see the “coldest night of the year so far” before snow blankets parts of the country. One of the lowest overnight temperatures was expected in Altnaharra in Sutherland with -12C forecast and -10C predicted for both Tomintoul and Dufftown. Ms Maxey said: “The coldest temperature we have seen this year is minus 13C in Scotland, and we are likely to see temperatures slightly below that. The Aberdeen-based forecaster said it was not yet clear if the weather warning would be extended into Saturday. But she added: “There will still be a risk of snow on higher ground on Saturday, but Sunday will generally be much milder and cloudier.